Abstract: In this talk, I will present some of my recent work on modeling coupled natural-human systems (CNHs). We have mathematically operationalized a conceptual framework of such systems (which we generalize and call “coupled infrastructure systems,” or CISs) by developing a stylized model that captures the interplay among their biophysical and social components. Analysis of the model yields interesting insights in the form of clear relationships between biophysical and social factors as well as infrastructure characteristics, particularly the conditions under which such a CIS may collapse or be sustained in the long run. I will also briefly discuss some future research directions, including different model formulation, more complex settings, and quantification of system robustness and resilience. Biosketch: Dr. Muneepeerakul has worked on a wide variety of problems, ranging from life to social sciences, from biodiversity patterns in river networks to dynamics of coupled natural-human systems. His primary investigative tools are mathematical and computational models. 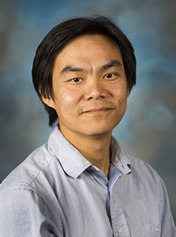 He is interested in dynamical models, complex networks, game theory, and stochastic processes. His diverse research interests are reflected in the projects in which he is involved and his publication record. In one project (NSF-CNH), he has been investigating how robust or vulnerable irrigation systems are with respect to rapid changes in disturbance regimes, both social and biophysical; he is expanding this line of research to coupled natural-human systems more generally. Another ongoing project (DoD-SERDP) addresses the biodiversity patterns of aquatic ecosystems in dryland streams whose challenging characteristics include pronounced hydrological seasonality and spatial heterogeneity. In another line of research, he and his colleagues apply complex network approaches to study structure of urban economies. Several other projects are under development, all of which share a common theme of inventing and blending concepts and analytical/computational techniques from different disciplines to achieve meaningful insights.